What is Localized or Locally Advanced Prostate Cancer? In order to plan your treatment, your doctors will need to determine whether the cancerous cells have spread within your prostate, or beyond. 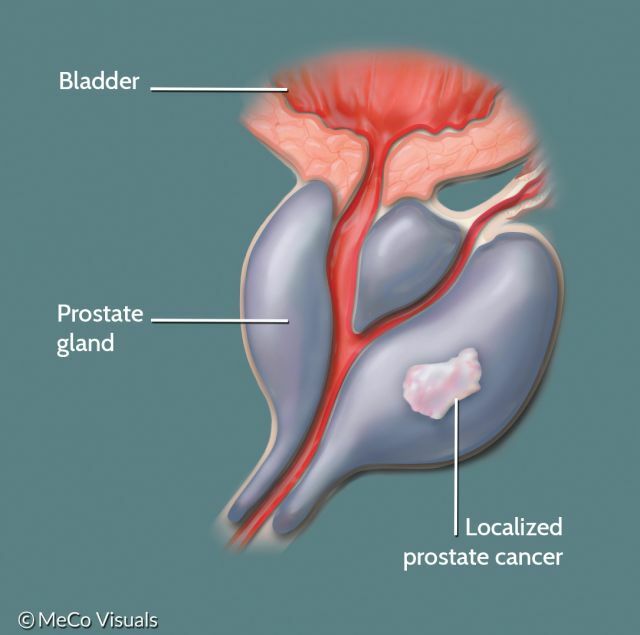 In localized prostate cancer, the cancer has not spread outside the prostate. In locally advanced prostate cancer: the cancer has spread to nearby organs outside the prostate, but not to distant sites, such as lymph nodes or bones. Health care providers think about localized or locally advanced prostate cancer in terms of “risk groups,” which are assigned before the patient undergoes any treatment. There are 3 general risk groups based on the PSA, DRE, and biopsy, which can further be subdivided to better personalize treatment for each patient. A man diagnosed with localized or locally advanced prostate cancer has 3 major treatment options: Active Surveillance, surgery, and radiation therapy. Radiation therapy is sometimes combined with hormone therapy. Surgery is almost never combined with hormonal therapy. Learn more about treatment options for prostate cancer.